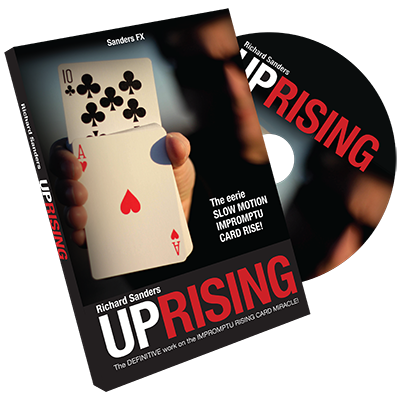 Today, when you order "Uprising by Richard Sanders", you'll instantly be emailed a Penguin Magic gift certificate. You can spend it on anything you like at Penguin, just like cash. Just complete your order as normal, and within seconds you'll get an email with your gift certificate. 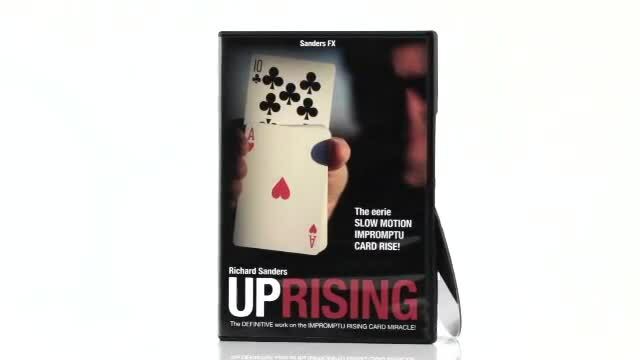 Uprising by Richard Sanders (DVD) The PERFECT slow-motion rising card trick. Use ANY deck, even BORROW one. NOW SHIPPING. HIGHLY RECOMMENDED. A Master Class on the Impromptu Rising Card Miracle! 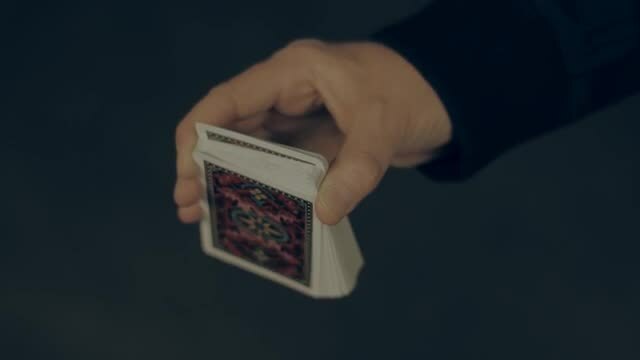 This project represents 15 years of research, thought, experimentation and practice into one of the greatest card effects for the modern conjuror. 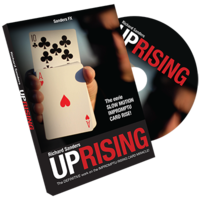 Building on the work of Fred Robinson, Eric Mason, Ken Krenzel and Richard Kaufman, Richard Sanders has redefined the classic rising card effect and transformed it into a true anytime, anywhere miracle with a deck of cards. This project is not a fly by night, pipe dream. Uprising is a solid workhorse of a technique. The eerie, slow motion rise can be performed in any situation and even surrounded. On this DVD nothing is held back. You will be privy to all the inside work on this amazing underground technique. Sanders explains the rise in every scenario with thoughts on angles, performing conditions, subtleties and more. PLUS learn the inside work on Sanders pet secret THOUGHT OF CARD TECHNIQUE. Using this with Uprising creates a truly eerie piece of magic. In addition to the DVD training you also receive a custom black silk. This is impromptu trick and beautiful illusion. Uprising can be used with any deck, at any time. You don't have to use the black cloth, but it does lend an element of mystery when doing so. I already own many Gregory Wilson's DVD's so if you own some you probably already use this sleight! It's not new material which is kinda disappointing! If you don't own Gregory Wilson's DVD's then for sure get this you will like it this move will be new to you. 3 of 6 magicians found this helpful. THIS IS A NOTHER GREAT TRICK BY RICHARD SANDERS. THIS IS NOT FOR BEGINNERS. 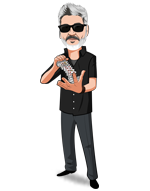 THERE ARE SLIGHT MOVES AND THE CARDS NEED TO BE WHERE HE TELLS YOU. BUT I THINK WITH SOME PRATICE IT CAN BE DONE. EVERYONE WANTS TO SEE THER RAISING CARD TRICK. THIS ONE IS GREAT, NO GIMMICKS ANY DECK CAN BE USED. GREAT JOB RICHARD. Maybe for a Pro no problem. Intermediate.... tough cookie. This it one of the best rising cards!!! This method allows you to do a anytime anywhere slow motion rising card with no gimmicks at all. My favorite way to do it is when they think of the card and you use the handkerchief. The DVD is perfectly produced. Richard teaches the rising card really really well. He teaches multiple techniques. You do have to practice but once you got it down it looks like real magic. With all of that being said, i really think you should get this you won't be disappointed. Well done Mr.Sanders, well done. This is one of the best rising cards ever. The technique is easy to do. It takes a bit of practice but you will get it down in no time. When done right it looks like real magic. The DVD is produced perfectly. the handkerchief you get is really well made. Richard teaches the technique really really well. The people that i have showed to freaked out. All in all i think that you get this.